Protesters staged sit-ins on five bridges crossing the Thames. Hundreds of people descended on the capital on Saturday for the Extinction Rebellion climate change protest. Scotland Yard said on Sunday that protesters were predominantly detained for breaches of the Highways Act, following staged sit-ins on five bridges crossing the Thames. Other arrests were made for offences under the Bail Act. A previously reported figure of 85 arrests was revised down due to duplicating reports made by officers. Saturday’s action saw bands and speakers address crowds on Lambeth, Westminster, Waterloo, Blackfriars and Southwark bridges as part of a “rebellion day”. Campaign group Extinction Rebellion warns that the planet is facing an “ecological emergency” and wants government action to reduce carbon emissions. 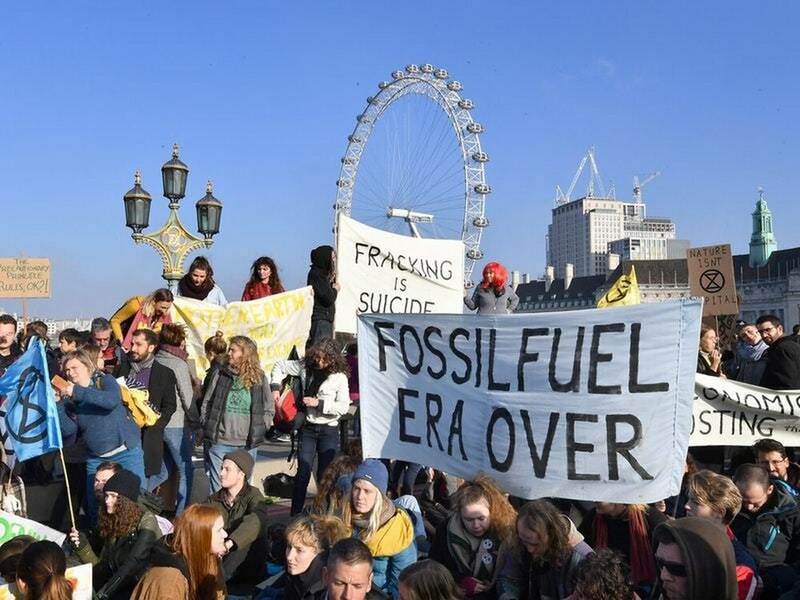 One organiser on Saturday warned of starvation in the UK if there is no change to environmental policy. Gail Bradbrook said: “We could easily be facing starvation in the UK if the weather effect continues as it is. Dr Bradbrook said: “We’ve basically got three demands – one is that the Government have to tell the truth. “People think that climate change is something happening to somebody else at some other time but it’s coming home. “We need to go to net zero carbon really quickly. And we’re also asking for a people’s assembly so people can decide how the change happens. The bridges event followed on from a series of protests carried out by activists in the past week. On Monday, 22 people were arrested after protesters blocked traffic and glued themselves to entry gates at the Department for Business, Energy and Industrial Strategy. On Wednesday, more activists were detained following action near Downing Street and at the Department for Environment, Food and Rural Affairs in Westminster. A “swarming roadblock” is also planned for Parliament Square from 7am between November 21 and 23.